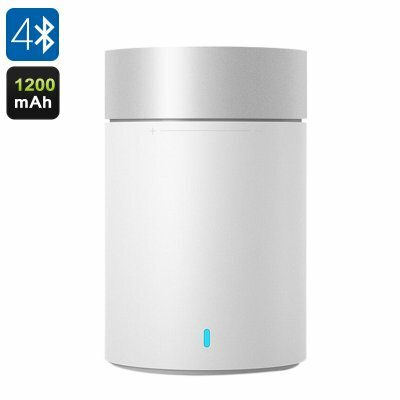 Successfully Added Xiaomi Mi Bluetooth Speaker - Bluetooth 4.1, LED Indicator, 1200mAh Battery, Built-In Mic, 10M Range (White) to your Shopping Cart. This wireless Xiaomi Mi Bluetooth speaker lets you listen to your favorite tracks straight from your smartphone at any time of the day. Simply pair your Bluetooth device with this wireless speaker and you’ll be able to enjoy all your music in stunning audiophile-grade quality wherever you are. Thanks to its stylish miniature design, this Xiaomi Mi Bluetooth speaker is highly portable – allowing you to carry it along no matter where you’re headed. Whether you like to listen to your favorite tracks while enjoying a sunny afternoon at the beach, or simply are searching for a modern and stylish audio accessory for in your living or bedroom – this wireless speaker from Xiaomi is sure to meet your audio demands. Crafted out of high-end ABS and PC material, the Xiaomi Bluetooth speaker is not only extremely durable but also features a stylish and modern design that is a true feast to the eye. Supporting a maximum power output of 5W, this wireless speaker allows you to crank up the decibels and enjoy all those all time classics in their fullest glory. Along with its lightweight yet powerful 1200mAh battery, this wireless Bluetooth speaker provides you with 7 hours of continuous music listening time – allowing you to enjoy a day filled with the music you love most without ever needing to worry about battery life. Additionally, this stylish Bluetooth speaker also features a sophisticated LED power indicator that keeps you constantly updated about your current power level – assuring that you’ll never run out of juice unexpectedly. Compatible with the majority of Bluetooth devices out there, this wireless speaker allows you to simply pair it with your laptop, smartphone, or tablet. Its 10-meter connectivity distance supports your mobility by allowing you to walk around with your smartphone in hand without disturbing the Bluetooth connection between your mobile device and wireless speaker. A built-in microphone additionally allows you not only to listen to your favorite tracks through this beautiful wireless speaker but also to engage in hands-free phone calls at any given moment – allowing you to conveniently answer your phone calls without physically needing to reach for your smartphone. Whether you’re looking for a powerful wireless speaker that allows you to listen to your music on the go, or simply are looking for a stylish and modern audio accessory for in your home – the Xiaomi Bluetooth speaker is guaranteed to meet your demands. With its beautiful miniature design and great audio quality this wireless speaker from Xiaomi is the perfect gadget for all Audiophiles and music lovers out there. The Xiaomi wireless speaker comes with a 12 months warranty, brought to you by the leader in electronic devices as well as wholesale electronic gadgets..